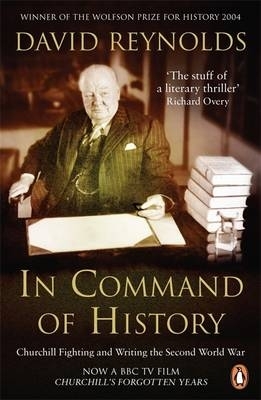 I have been rereading David Reynolds’s masterful account of how Winston Churchill wrote his five volume history, The Second World War. This was an enormous undertaking, for which the great man recruited a research and writing team which included an ex-Cabinet Secretary, the Army general who had been his chief wartime military adviser, another retired general who was on the Advisory Committee for the Official Military Histories, a retired naval commodore, the future Warden of St Anthony’s College, Oxford, and a young barrister and historian who had won the MC in the Far East. This group, nicknamed the Syndicate, were responsible for researching and drafting most of the material which went into the five volumes, published between 1948 and 1953. I will write more one day soon about Churchill’s writing and production methods, but what caught my eye on this occasion was Reynolds’s account of some of the proofreading howlers which bedevilled the first edition of the first volume, The Gathering Storm. To meet the demands of his American publisher, the book had been first published in New York by Houghton Mifflin in June 1948, but Churchill did not regard this as the definitive edition. He insisted that his London publishers, Cassell, incorporate all the textual errors from the US printing – and more besides – into the UK edition, before final publication in October. Even so, more errors were discovered after many of the sections had been printed and this resulted in two pages of Errata and Corrigenda being incorporated into the book before the Index (unnumbered, but following p.610). 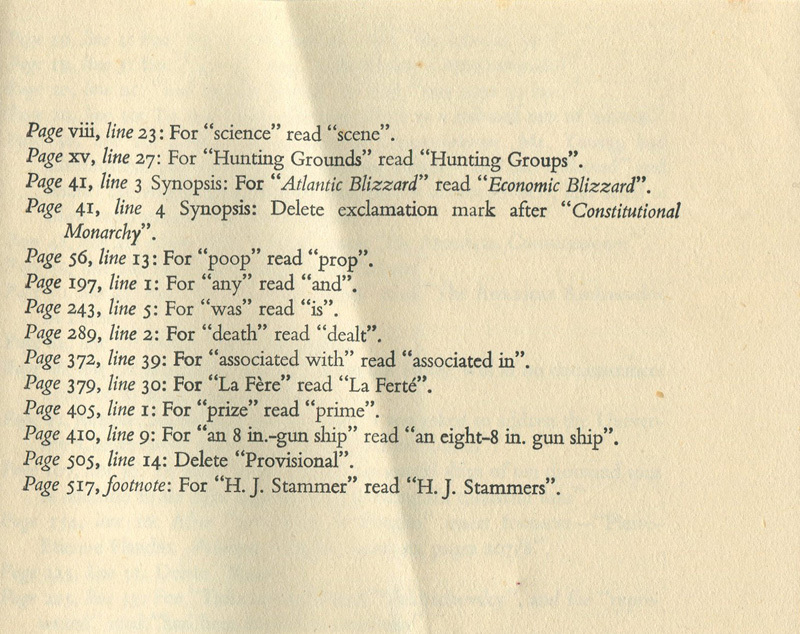 Further errors were then identified just before the final binding, so this list was added to by another tipped-in slip which is shown below. The most embarrassing error overall was probably the one which is corrected on this slip, which described the French Army as the ‘poop’ rather than the ‘prop’ of France. 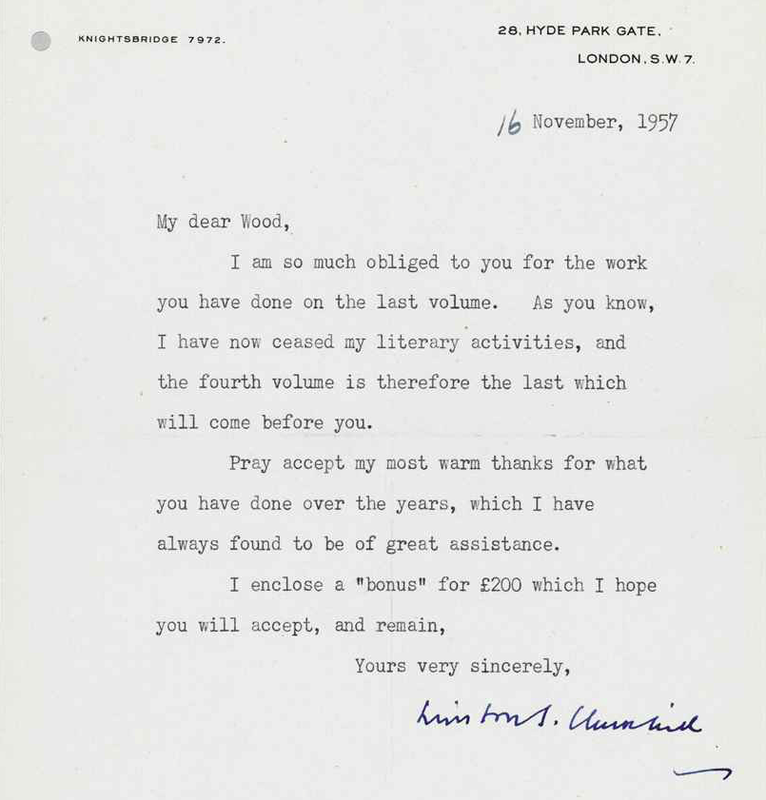 At this point, Churchill called in the proofreader who had worked on his pre-war biography of Marlborough, Charles Carlyle Wood, He was invited to lunch at Chartwell on 4 October 1948 and given the galley proofs of Volume II, Their Finest Hour. Wood had in fact offered his services more than a year before, but had been politely rebuffed. He wasn’t really to Churchill’s taste – he had once described him as ‘indefatigable, interminable, intolerable’ – and he certainly didn’t endear himself to Desmond Flower of Cassell’s, who complained that he was altering the sense and wording of some passages and that he had removed 219 commas and added 217. But Wood persisted, and remained on the team for the remainder of the project. He also worked on Churchill’s later books, A History of the English-Speaking Peoples. At the conclusion of this series, in 1957, Churchill told Wood that his own writing career had now finished. In a friendly personal letter, seen below, he sent him a ‘bonus’ payment of £200 and thanked him for his efforts over the years. Wood died in 1959. He is remembered here by his granddaughter on her family history page. Source: David Reynolds, In Command of History, Penguin 2005.